A guest post by Carl Sommerfeld, a science teacher at John Oliver Secondary where he shares his experience of “teaching students to ask their own questions” by using the question formulation technique shared in the book “Make Just One Change”. Recently I decided to introduce the Nervous System to my Biology 12 students in an unconventional way. 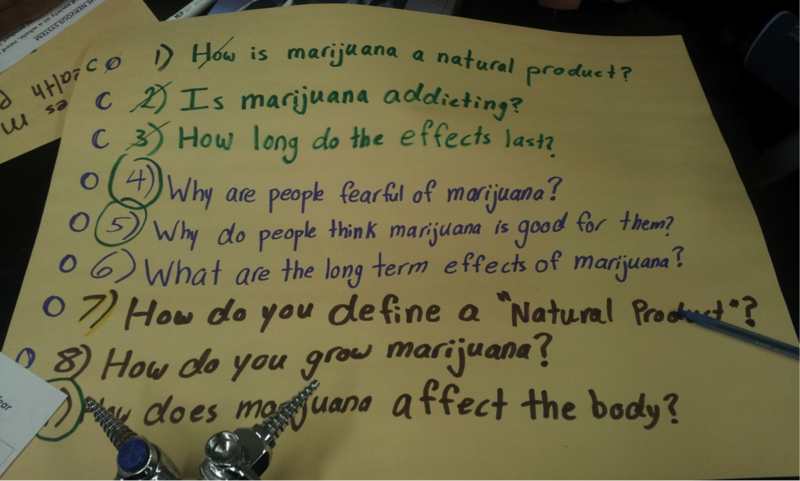 With a Focus Statement guiding their brainstorming session, small groups came up with their own questions about what they’d like to learn about the Nervous System and Marijuana. “The human body, and society as a whole, need not fear marijuana as it is a natural product” was the statement at the top of their handout, replete with rules for coming up with questions during group time and what to do with them when they were finished. To further spark interest, especially in my kinaesthetically gifted students, five models of the head and brain were procured from our media services department at the board, one for each group. It’s amazing how touching and fumbling with pieces of a model can engage students and further probe their curiosity. The questions came slow at first but the pace quickened, helped by different coloured markers and large poster paper. The group members had wide ranging abilities and interests and yet the rules stated that all questions were acceptable and to be recorded verbatim. No discussion was allowed, nor judgment around what constituted a good question. This was not the time for answering or discussing, just questions. After labelling all questions as either “O” or “C” they had to change one open-ended question to a closed-ended, and vice versa. 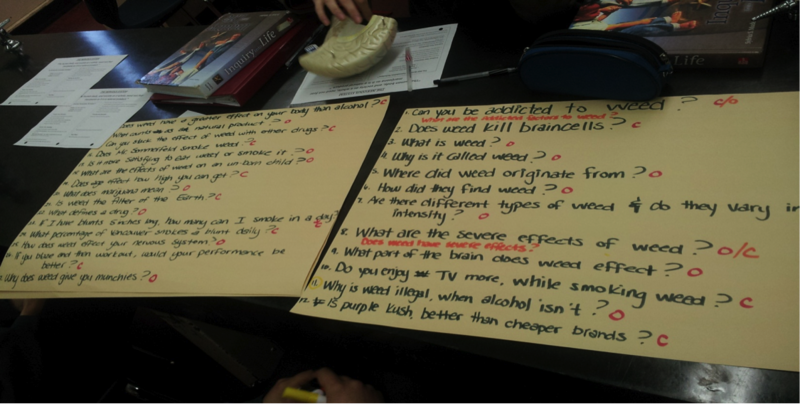 I asked them which type of question they’d prefer on a test – they had reasons for both. I asked them what type of questions their parents asked; what types of questions were useful for group discussions? Posting each groups colourful montage of questions with big pieces of tape allowed them to see what their peers wondered about. If the student’s had it their way research would have started right then. I wish this was the norm. The handout prescribed the need to prioritize their questions and copy down the three best, in order of importance. The following class was booked in the computer lab where research was undertaken on an individual basis. The third class saw them getting together in their original groups to collate the research on the three questions and report back to me. Each group had their own highlighter and chose those bits suitable to answer the questions best. As a beginning teacher it will take time for me to guide students into questions that will reach the level expected at the senior level, and even more time for students to rearrange their perspectives and abilities to ask better questions. A colleague mentioned maybe the answers don’t even matter as much as the questions that are being generated. Maybe the students wonder about more than what movie stars had for breakfast or who married who’s best friends’ daughter’s ex-boyfriend. And maybe helping them think differently isn’t so difficult after all. This entry was posted in Uncategorized and tagged biology, book, change, engagement, inquiry, planning, science. Bookmark the permalink. Thank you for posting Carl’s great description of his use of the QFT. I especially liked reading: “If the students had it their way research would have started right then. I wish this was the norm.” Members of the Right Question Institute’s Educator Network would benefit from learning about your work. You can share at rightquestion.org. Thanks for commenting on the post. The “penny has dropped” for me on teaching students to ask their own questions. I have been learning more and more about inquiry in the past few years and I can see how the QFT is key piece to making changes in my own practice. Currently I am a non-enrolling teacher in a district position but after next year will be returning to the classroom when my three year term in this position ends. When I left my school in 2011 I had a big gap in my professional knowledge — basically how to support students in generating their questions (see the big void that I had built in anticipation in my “NEW” unit plans https://renomyclass.com/unit-plans/my-unit-plans/). Now I know how I can help students not only generate a few of their own questions, but also how I can use their questions to drive an whole unit of learning. I will try to share what my colleagues are doing and, once I have students of my own again, also share what we do.